In this class we will dye fabrics in the color wheel gradation to create beautiful fabrics for your stash. This class will also give you a deeper understanding of the color wheel. Stop by at the store at our Class Expo (May 3, 5-730 pm and May 4, 930-11) and take a look at the samples. In this new class, join Robin for 4 weeks as you build your skills. Pick your own pattern, and Robin and all of her experience will be right beside you to grow your knitting skills. This class is for intermediate knitters, who already have a grasp on the basics. Come learn, grow, and make new friends in this fun group! So, you've been wanting to learn to quilt, but didn't know where to start! First, you need to learn to use a rotary cutter. Sign up for this class and Cindy will teach you to use one. You'll choose the size and the fabric to make a table runner. And don't forget to register for Quilting 2-4, too! You know you want to! The right tool for the right job makes everyone?s life easier! In this series of classes Cindy will highlight a technique or tool to make your quilting life better and allow you to finish your quilts faster and with more accuracy. You will have the choice of at least three patterns to make a quilt that suits you best. If you have a quilt that could be simplified by using the highlighted technique/tool, you can even choose your own pattern with prior approval by Cindy. Learn how to Knit, Cast On, and Bind off. We will work our way through projects that are designed to build skills. Work at your own pace through the 4 week class and receive help mid-week if needed. Learn to Cast On, Knit, Purl, and make hats and cowls for your loved ones or to keep your own head or neck warm! This class is designed for those who took the beginning knitting as a ?continuing knitting? class. 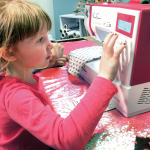 Come in and learn about our class and group sewing opportunities for the months of May, June, and July. Capture the traditional mended appearance of Japanese BORO by hand-stitching patches to Modas printed Sashiko fabric (available at Hip Stitch). In this class--the second in our Quilting 1-4 series designed to teach you the four basic steps of making a complete quilt--you'll make the quilt top. What kind of a quilt do you want to make? Make an appointment with Cindy to come in and pick out pattern and fabric. Join Bralia on the 2nd Wed of each month to sew bags for Beads of Courage. Beads of Courage helps more than 60,000 critically ill children in eight countries record, tell, and own their stories using colorful beads as meaningful symbols of courage and hope along their treatment journey. Bring a Kimberbell project to work on and/or purchase a Kimberbell-Exclusive bunny bag design and kit. Make a decorative table topper to match any season or occasion. We will have kits available or pull from your stash. You will fall in love with these fantastic table quilts. Having an issue with your latest quilt? Let our experts help you! Bring in your project and let us help you keep on stitching. Jelly Roll Rug OR Jelly Roll BOWL! Cindy's been sharing her tips and techniques for making the uber popular jelly roll rugs and NOW is extending her teaching into making bowls out of jelly rolls. For this class, come in and choose which one you want to make. Welcome to Hip Stitch Charm School! No, we don?t think you need to be schooled on manners but we want to offer you an opportunity to utilize those 5-in fabric squares that may have been multiplying in your stash. Charm School will feature designs that utilize those squares. This three hour class will be beginner friendly and teach techniques that will further enhance your quilting repertoire. Charm School projects will predominantly feature table runners and baby quilts but many of these projects can be expanded to larger sizes by using more charm square packs. A two-day Kimberbell Event brought to you by Hip Stitch! By popular demand we are offering again stamp printing on fabric. In this class we are going to use art foam stamps to print on fabric for a future project such as a pillow case, apron, or a table runner. The stamps are fun and easy to use and the result is crisp, clean prints. Come and make your own custom fabric. Hang out with Diana and enjoy exploring the art of hand stitching. Bring in your own project or she'll help you create one using materials purchased at Hip Stitch. Join the club and get 20% off all Kimberbell merchandise, stabilizer and machine embroidery thread. Any time, all the time! In this series of classes, Cindy will highlight a technique or tool to make your quilting life better. Choose from at least three patterns per month to make a quilt that suits you best! Become a member of the Quick Quilts Club and you'll receive a discount on a year's worth of classes! Join On the Mountain Retreats and Instructor, Julie Bauer for this two and a-half day Jalie teaching retreat at Hip Stitch in Albuquerque. Students will complete two Jalie knit patterns. Julie Bauer has taught dozens of the Jalie patterns in the past 3 years and has sewn personally in Canada with Emilie, one of the owners of Jalie. Why carry a tote bag when you can wear a HANDS-FREE cross-body soft bag? Hand stitch patches to the boro and embellish with a Sashiko running stitch. Assemble the two sides of the bag, add the lining, BUT before stitching the bottom of the pattern has a twist ? both the back and front have both fabrics! Is your 8-15 year old looking for a project this summer? Knitting is a great distraction over the summer break and hey, you might learn a few things too! Join your child or grandchild, and learn how to make scarves and hats. Learn to Cast On, Knit, Purl, and make hats and cowls/scarves. You'll learn how to add batting and backing to your quilt top and then how to do some straight line quilting with your walking foot. This is the third class in our four-part series to help you learn to make a complete quilt. Have you been wanting to get into garment sewing, but been a little intimidated about where to start? Have you been worried the patterns won't fit you right or won't fit you at all? Then this is the class for you! Come join us in making the York Pinafore from Helen's Closet. 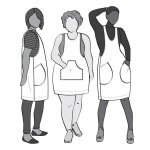 This pattern is available in sizes 0-30 and is perfect for all sewists--even quilters wanting to move into garment sewing! Come join us and learn to sew. By the end of the week you'll have learned to use a sewing machine and will have several projects to take-away and use. Low water Immersion dyeing is also known as the "Scrunch Method". In this method, one uses as little water as possible, scrunching the fabric together to create bursts of colors. You will walk out of the class with 12 amazingly beautiful fat quarters. Continue your sewing journey. This class is meant for you to take your beginner skills and make them more mature. In this camp, you'll make a crazy quilt tote bag and a rag quilt. You've got a finished quilt--almost! In this class--the final one in our four-part series in making a complete quilt--Cindy will walk you through adding binding. In this class you will be able to create unique fabrics printed from leaves you have collected in your yard or on your nature walks.The beautiful shapes and texture of leaves create lovely organic patterns that nature provides for us to enjoy. Joyce has decided to give you the choice of making either her Boro Scarf or her Boro Cross Body Bag today! Joyce first offered the Scarf Class on May 7 and the Cross Body Bag class on June 4. So, you need a quick quilt top? Pre-register, grab one of our jelly rolls, and settle in with Bralia to join those strips together. You'll end up with a colorful and easy top that's about 50 in by 64 in.